On October 22, 2013, co-hosts Lee Kantor and Stone Payton of BusinessRadioX®'s Midtown Business Radio welcomed to the studio Dale DeSena, Founder and President of Taste of Atlanta, to spotlight the upcoming 12th Annual Festival. 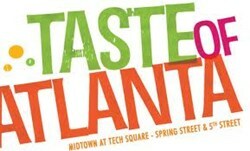 The legendary three-day food festival known as Taste of Atlanta returns to Midtown at Tech Square Friday, October 25 through Sunday, October 27, 2013. Taste of Atlanta, the city’s premier food+wine+beer+cocktail event, attracts food lovers from Atlanta, the Southeast and beyond to showcase the area’s finest restaurants for a weekend of big fun and great fare. Guests of all ages will enjoy an extensive selection of culinary creations, engaging chef demos, specialty food and beverage tents and family-friendly activities. The event highlights Atlanta as the Food Capitol of the South. Dale DeSena is a seasoned foodie and festival expert with experience in marketing, advertising and production for some of Atlanta's most renowned events. According to DeSena, "I wanted to create something Atlanta hadn’t seen – or tasted – before." For the last 12 years, DeSena has been doing just that with Taste of Atlanta. The Festival includes over 90 of Atlanta's best restaurants, and guests can sample delicious dishes, sip robust wines, craft beers, and innovative cocktails. Hungry for more information about Taste of Atlanta? Tune in to this episode of Midtown Business Radio. Each week, from the BusinessRadioX® studio in Atlantic Station, Lee Kantor and Stone Payton interview Atlanta, Georgia's top businessmen and businesswomen to learn what makes them the best at what they do.